Since 2011, the American Meteor Society (AMS) online fireball report form has been translated in 30 different languages. We now receive thousands of reports from all around the world. Lately, we received more than 120 reports about a Fireball event that occurred over South East of France (Provence Alpes Côte d’Azur) on October, 30th. AMS Event#4047-2017 – Witness Location and first estimated ground trajectory. Retired nuclear scientist, Michel Deconinck has been lucky enough to be one of the witnesses of this impressive event. Deconinck has observed meteors since 1975 and he has been a very active member of the international amateur astronomers community since then. He has been the chairman of the meteor section of the IUAA (International Union of Amateur Astronomers) for 10 years and he still works closely with the AAVSO (American Association of Variable Star Observers) as a consultant for the french speaking community. On October, 30th, his trained keen eye allowed him to exactly remember the 4 second fireball that flew in front of him. Right after the event, Deconinck took his pencils and decided to water color the event. 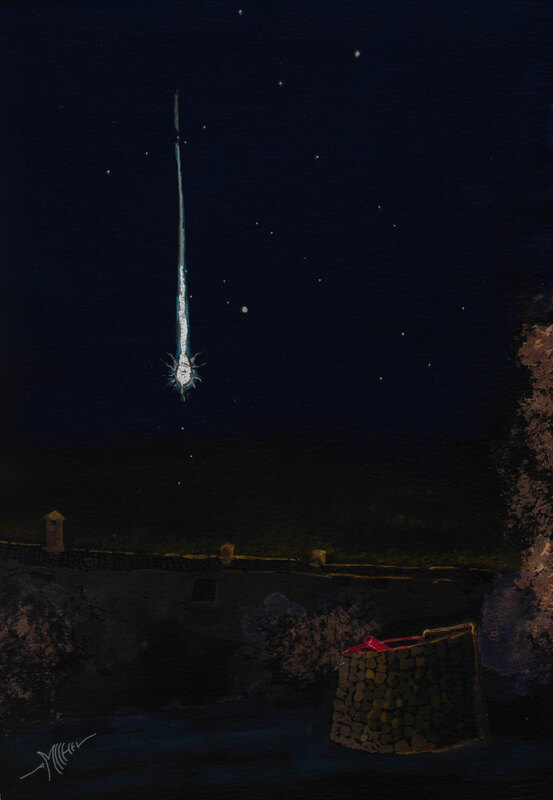 An avid drawer since childhood, Deconinck knew exactly where the fireball occurred in the sky and was able to place all the stars present in the scenery. In the foreground, we can see his personal observatory illuminated only by red LEDs. From his position, the fireball went from the variable star chi Cygni in the constellation Cygnus to the Vega (α Lyrae), the brightest star in the constellation of Lyra. This is not the first time Deconinck has drawn meteors. We can see many examples of his artwork on this personal website: astro.aquarellia.com. The French fireball was also witnessed by Alexandre Astier, a famous French writer, director, editor, scriptwriter, humorist, actor and composer. Astier shared the event on his personal twitter account to draw attention to the general public of the event. Astier is most known as the creator, director, writer and lead actor of the French television series Kaamelott, in which he also plays King Arthur. Funny enough, he also played a comic show called “L’Exoconférence” about extraterrestrial life in 2014. Many famous french astronomers were involved in the making of this show. That is so cool. Meteors are one of those natural phenomena that is compelling and mysterious that makes artists want to capture the intricacies of nature in its finest form. Maybe one day we’ll have the mobile technologies to see meteors up close. I love the detail in the French fireball.